Has your fear of the dentist or an invasive procedure prevented you from scheduling your next dental appointment? You are not alone. In fact, 36% of the 30 to 40 million people suffering from dental phobias avoid seeing their dentist regularly. To help get the care you need while overcoming your anxieties, your sedation dentist in Farmington can help. Although you know that the use of sedation is beneficial, you still have several questions before you are ready to schedule an appointment. To help put your mind at ease, here are the answers to your top questions. Sedation has become a popular option during dental appointments because it helps patients relax. Despite what many tend to believe, you are not unconscious when moderate or conscious sedation are used. You will still be able to communicate and respond to the dentist’s ques, but you will not feel anything. However, if IV sedation is used, you will drift off into a comfortable sleep while not feeling any pain. Your sleep dentist in Farmington can use sedation to cater to several individual needs. In addition to helping those with dental fears and phobias relax, it is also a perfect option for those who need to undergo complex or lengthy procedures. It can also help those who have a strong a gag reflex, difficulty holding the jaw open, or those who have complications getting numb. The most common types of sedation offered at dental practices involves nitrous oxide and oral conscious sedation. 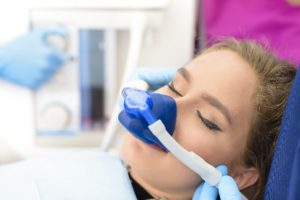 Nitrous oxide, better known as “laughing gas,” has been used for more than 100 years because it is effective without causing many side effects. As the medication is inhaled through a mask, you will reach a high level of relaxation. After the mask is removed, the effects dissipate quickly. Oral conscious sedation involves the use of a prescribed medication that is taken prior to your appointment. As the medication begins to take effect, you will quickly feel relaxed and at ease. It can take several hours to wear off, so you will need a friend or loved one to drive you home from your appointment. You will not feel any pain or discomfort with sedation dentistry. In some cases, you may not even remember having a dental procedure performed. Although the use of sedation is safe, your dentist will need to review your medical history to ensure that you are a candidate for it. If dental fears and phobias have held you back from scheduling an appointment, it is time to see if sedation dentistry is right for you. Dr. James Cole is a trusted dentist in the community for complete dental care. In addition to general dentistry, he has also undergone additional training to offer sedation. He will safely and effectively help you overcome your dental fears for a relaxing and comfortable appointment. If you are ready to see if sedation dentistry is right for you, contact Integrity Dental today.